Church Cottage is a picturesque, detached one bedroom cottage situated on the slopes of the Mendip Hills, close to Bristol, Bath, Wells, Cheddar. It is situated in the village of Blagdon, which nestles between the Mendip Hills and Blagdon Lake. The Cottage sleeps 2 and has recently been fully modernised, fully equipped and tastefully decorated throughout. Many original features such as the flagstone floor, beams and fireplace have all been retained. 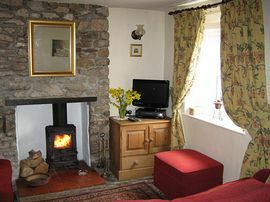 On the ground floor is a very cosy sitting room with wood burner, comfortable suite, digital TV, DVD and CD player. Also on the ground floor is the attractively fitted kitchen with electric cooker, microwave oven, fridge-freezer, toaster, cafeteria and a comprehensive range of equipment and utensils. Off the kitchen is a secluded, private patio with seating, table, barbecue and a variety of tubs containing shrubs and flowers. The outbuildings have been converted into a utility area, with washing machine and tumble dryer, as well as space to store logs, bikes, fishing or walking equipment. A concealed staircase leads from the kitchen to the first floor bedroom. 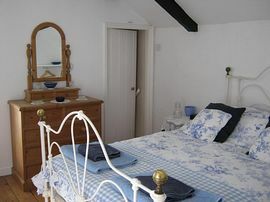 This picturesque room has a comfortable double bed and pine furniture. Off the bedroom is the en-suite bathroom with full size bath and shower over, WC and washbasin. The patio also has a cast iron table and chairs. 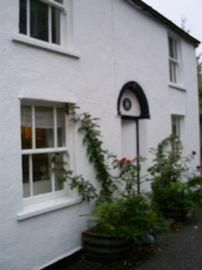 Church Cottage is available throughout the year.